The Best Newport to Ensenada Race? For the past week I have been stuck at home recovering from a small operation and have had the chance to look back at some previous writing. A friend of mine is helping to promote the Newport to Ensenada Race this year and he got me thinking about the race. Many sailors complain about the N2E for whatever reason and it really is a shame. For most, it is the one chance to do something adventurous with their boats. You have the chance to race overnight into another country! Yes, it can be tedious in the wee hours of the morning slopping around in light air, but are we that impatient these days? Maybe the allure of Esnenada has diminished to some, maybe sailors are getting lazy? In any case, I still look forward to the race each year. It is always fun to get back from a race and read the forums. It is pretty fun to see the speculation, couch tactics and other pretty incorrect observations. And to the guy who says monohulls are boring.. you obviously do not sail the right monohulls my friend. Check it here. 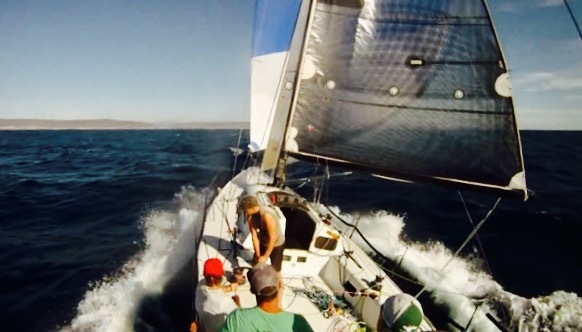 So here is how it went down from my perspective on board Viggo Torbensen’s J-125 “Timeshaver” which took second overall in the 2014 Newport to Ensenada Race. After losing one guy to sickness and another guy bailing out 5 minutes before the start (literally got on a power boat and left) we were down to six people. I wanted eight because I knew we had a long reaching race ahead of us and needed the bodies for sail changes and rail meat. No worries… We had a bad start and came off on port tack below Horizon and the other J-125 Derivative. In case you have not followed along in the past or are new to my writings let me give you a little history. On board Horizon is one of my best friends since age 12 and current co-worker Erik Shampain and his father, The legendary Hippie. Needless to say we have a fierce but friendly rivalry going and this was their last race on the boat (it is being sold!). Horizon is one of the most winning boats on the West Coast and is superbly prepared. Before the start I made the comment that the only thing that mattered was beating them.. if you beat them then you know you have done well. Off we go on port tack with 80% of the other boats. We have our #3 up and are just going bow down to get to the new pressure that is forecasted offshore. Horizon and Derivative battle it out and Derivative eventually pinches off Horizon forcing Horizon to go bow down and eventually go below us too. Within the next 30 minutes we do the same to Derivative but they decide to tack, and that was the last we saw of them. At this point we are in about 15kts of wind and just trying to stay with Horizon who are bow down and fast. We go the high lane and when we finally all start to tack and it is close. Horizon crosses a few boat lengths ahead and we extend a bit further and tack onto starboard (this was actually lay line for the finish). The next few hours are back and forth with the breeze going lighter. Lightest we saw was about 7kts for just about an hour. Our goal at this point was to stick close and wait for what we were hoping was going to be a shift and J-125 wind. It eventually clocked around and we threw up our 3A and staysail and started going fast. Horizon followed suit and went for their 2A (pole forward I assume). We had waypoints outside Coronado about 5 miles or so and were hopeful of going over the islands. Wind Gods said no, and we kept getting headed. As we got to the Coronado’s we were moving. Top speed 18kts at like 140TWA fully powered up. Jack Bazz, who had never been on the boat, made the comment that it was like Mr Toad’s Wild Ride… yes it was. Waves coming from every direction and us bouncing around from planning to launching off waves coming from the south. Fun stuff as I would almost lose my footing behind the wheel. All of us on deck were laughing our heads off as waves crashed over the front and kept up 15kts of boat speed for extended periods. Horizon’s light was falling further behind and we were quickly ramping up on a big boat in front of us. As we got close they had some kite trouble and we quickly passed to leeward. I think it was Elixir.. The party was crashed by the land. We were moving quickly towards the shore and had to take our kite down about 1.5 miles from the coast. Back to Jib reaching (n other words, Sc-50 weather). There was just to much of this for us and we could see the light behind moving closer. Eventually we got back into the spinnaker with a 5A and started reaching down and back in front of the boat that had caught up. At this point I did not know it was Horizon. Or maybe I did not want to believe it. We crossed the finish line at around 1:30am with no gybes and one tack. As I watched for the boat behind I got a glimpse of their spinnaker… Horizon. There is always talk about ratings and what not but we knew we had to beat ten by six minutes and didn’t. We were pretty gutted and more so when we found out it was first and second overall for both of us. The reality of it is I am just happy we can sail a competitive race with such a well prepared boat sailed by a World Champion GQ Model and his Dad who is a World class navigator and has more miles down this coast than anyone I have ever met. If you look at the corrected results we both crushed it and 3 minutes will forever haunt me! Oh and that was Ullman Sails first and second for the Newport to Ensenada Race! Have to say thank you to the most fun owner ever Viggo and our awesome crew (who made it) Blake Hamilton, Jack Maranto, Charlie Underwood and Jack Bazz. You guys killed it and I know I am a slave driver on the boat but it is worth it. Isn’t it?? Contact Keith Magnussen for questions or comments!